Protecting pipes from freezing and rupturing during the cold winter months can save businesses and homeowners from thousands of dollars of water damage. ProLine Radiant offers industry leading pipe trace solutions that can be installed quickly and easily. ProLine Radiant’s pipe tracing systems utilize self-regulating parallel circuit heat cables to provide the best solution for basic freeze protection applications. The cable’s self-regulating characteristics mean that when the ambient temperature rises, the electrical resistance increases and the consumption of electricity decreases, ensuring energy-efficient operation. And the cable will not overheat or burnout - even when touching or overlapping. Also, because of the self-regulating properties, a thermostat may not be necessary in some applications. With the optional outer jacket, the heating cable is resistant to watery and inorganic chemicals and protected against abrasion and impact damage. The self-regulating properties exist throughout the length of the cable, thereby allowing the pipe tracing cable to adjust the power output to the varying conditions along the length of the pipe. Contact ProLine to learn more about the pipe freeze protection options that are available (866.676.9276). The ProLine HTM self-regulating pipe tracing heat cable features advanced technology that results in highly effective, energy efficient operation. The UL listed cable provides safe, reliable heat tracing for freeze protection or temperature maintenance of pipes, valves, flanges, etc. It is suitable for use on small plastic or metal pipes and instrument tubing in residential or light commercial and similar applications. Energy Efficiency – Automatically varies its power output in response to pipe temperature changes. Easy Installation - Can be cut to any length required on site (up to max circuit length) so there’s no wasted cable. The power connection, splice, tee and end seal kit will reduce installation time. Low Cost – Less installation cost than steam tracing; less maintenance expense and less downtime. Versatility – Suitable for use in non-hazardous, hazardous and corrosive environments. Top Performance – The certifications and requirements achieved by ProLine pipe tracing cable ensure top performance and rugged durability. 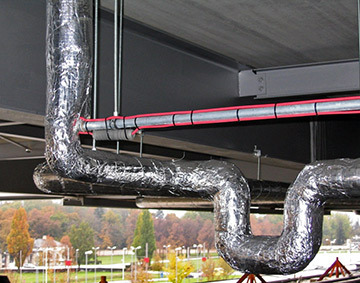 Large commercial and industrial buildings are especially susceptible to the damaging effects of cold temperatures on piping. Often, industrial facilities are unheated throughout the winter months, raising the chances of broken pipes, which can dramatically impact productivity and revenue. 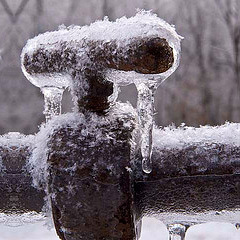 Heat tracing is the most reliable and affordable pipe freeze protection method available on the market today. The hospitality industry relies on properly functioning, well-maintained piping. A break in a pipe can result in lost customers and long term damage to the company's public image. ProLine's energy efficient pipe tracing systems provide reliable pipe freeze protection, process temperature maintenance and other heat trace solutions so your business can keep its customers and livelihood intact. Commercial and industrial facilities incorporate long line heating to ensure the proper flow of fluids through piping over long distances. Piping outside of heated areas are the most susceptible to the effects of cold weather. Much of the same technology employed in industrial long pipe systems is used for commercial applications. ProLine Radiant includes free installation training and expert installation support as well as industry leading products and support services. For more details or information about ProLine Radiant's pipe tracing solutions, contact us at 866.676.9276 today.